Watched intensely by two young spotters LNER V2 Class 2‑6‑2 No. 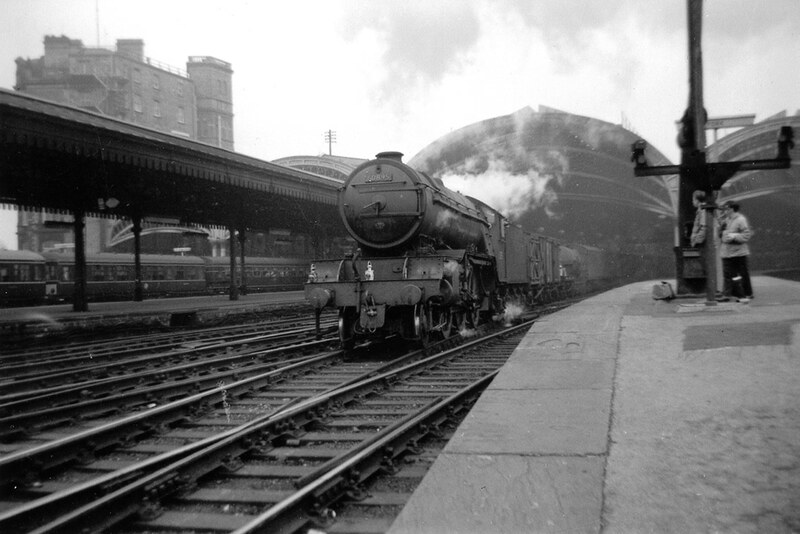 60895 powers a down fitted freight through York station, with its cavernous roof in the background, on a bitterly cold 26th October 1963. A long‑term favourite of the near‑at‑hand 50A, 60895 survived in revenue earning service until 4th October 1965. Fast forward almost two years and we find ourselves in the shed yard at 50A York on 12th September 1965 where we espy LNER V2 Class 2‑6‑2 No. 60876, a York resident, in steam in the company of a begrimed BR Class 9F 2‑10‑0 No. 92205 also of 50A. Condemned on 19th October 1965, 60876 was scrapped early in 1966. 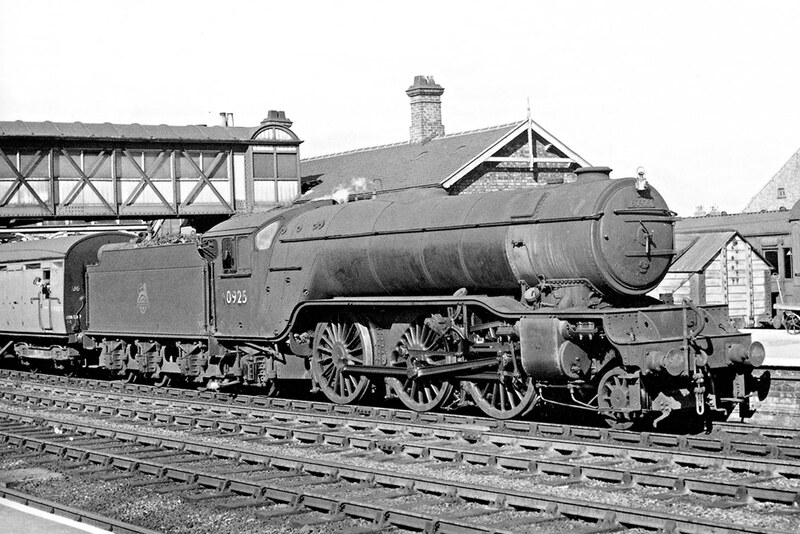 LNER V2 Class 2‑6‑2 No. 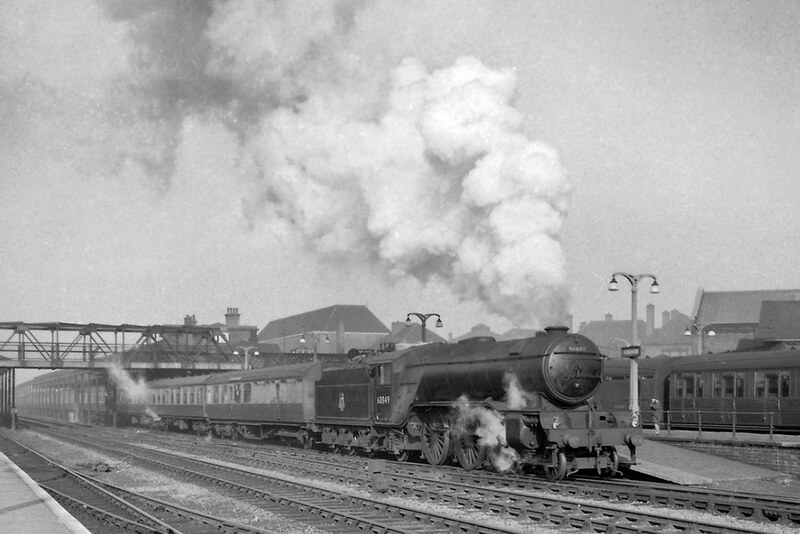 60849 departs from Doncaster in a flurry of smoke and steam with an express in the 1950’s. Constructed at Darlington Works 60849 entered traffic in March 1939 at Doncaster shed and after a period of years at a depot in Sheffield in the 1940’s returned to Doncaster being withdrawn from there on 12th April 1962. 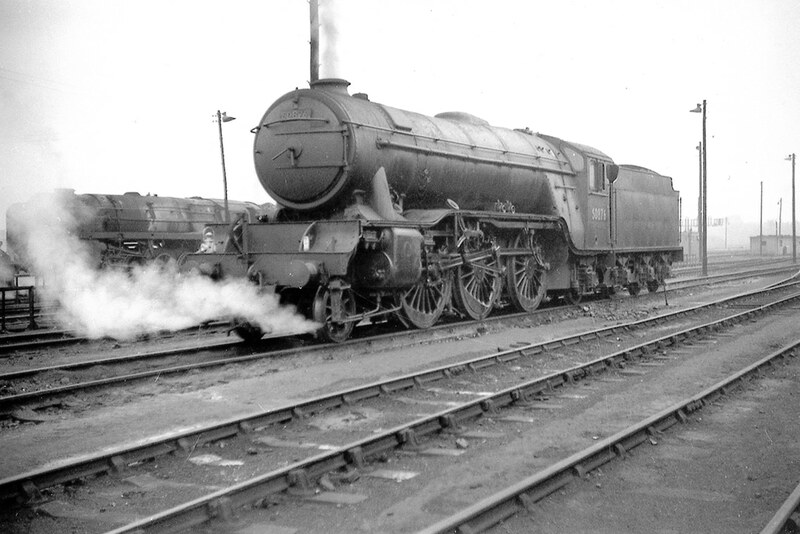 LNER V2 Class 2‑6‑2 No. 60925, its paintwork looking somewhat neglected, stands at Selby station with a local passenger train in the 1950’s. Another product of Darlington 60925 spent all of its working life at York depot succumbing to the inevitable (in the name of progress) on 25th May 1964 being cut up later in the year at Swindon Works. There are no known additional amendments or queries with regards to the disposals of the LNER V2 Class 2‑6‑2 locomotives, but any information to the contrary will be welcomed along with any confirmations or otherwise of verifications required. I hope this streamlining will add to the enjoyment of the existing chronological sequence of events appertaining to WHAT HAPPENED TO STEAM – Volume Eight.